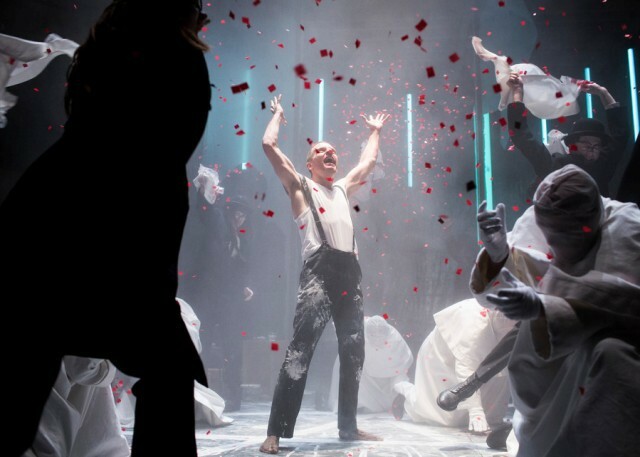 Visually, there's a vibrancy and freshness about this blood-thirsty, modern reworking of Christopher Marlowe's Doctor Faustus by the RSC. Directed by Maria Aberg, the woman behind the RSC's exhilirating The White Devil in 2014, she has again refreshed an Elizabethan play into something that a younger 21st Century audience can relate to. 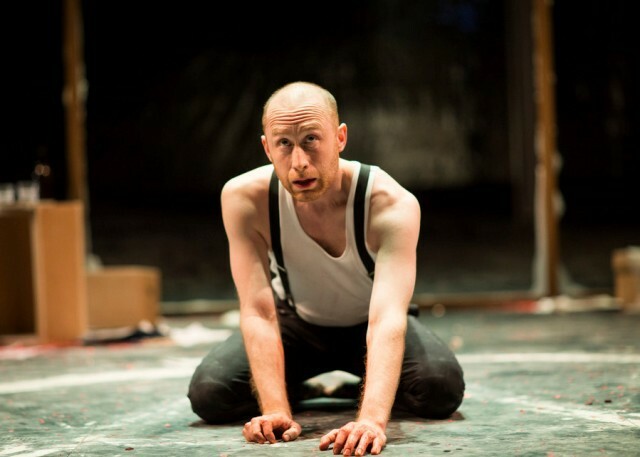 A modern refresh of Doctor Faustus has been created by the RSC. Never one to shy away from blood and gore, Aberg puts a utility knife at the centre of the action. Whether it's used by Faustus to carve up his arm for his bloody pact with the devil or as a weapon against his enemies, it becomes a sinister symbol. 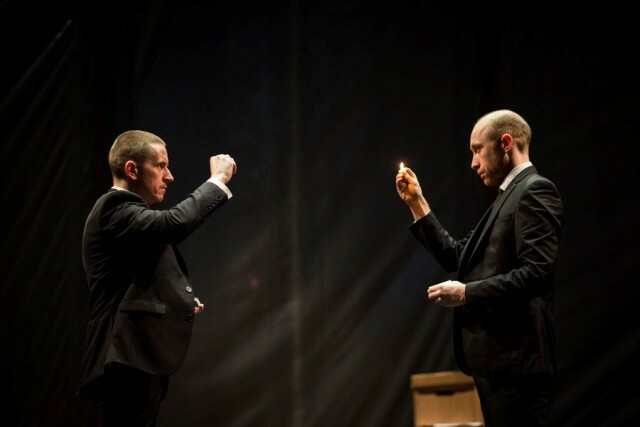 The real spectacle comes when the simple stage of Stratford Upon Avon's Swan Theatre is transformed into a huge magic spell with flames glowing over Faustus and his ill-conceived plan to hand over his soul in exchange for 24 years of absolute knowledge and power. Assistant director Josh Roche browsed an Elizabethan guide to magic and spells - The Book Of Oberon - as research for the play and Faustus' cantations and painting of white magic symbols across the black stage floor have an authenticity about them that probably originated in that book. Unusually, actors Sandy Grierson and Oliver Ryan are taking turns throughout the season at the lead roles of Faustus and the devil's servant Mephistophilis, who accompanies him as a companion on his 24 year journey. It could be for this reason that the pair have created a strong bond when on stage and there seems to be a symmetry between the two characters. From the very first scene, there's a suggestion of them being a mirror image of each other. The version I watched had Grierson as Faustus. He was intense but also had the ability to seem vulnerable and frightened as his fate drew near. Ryan's Mephistophilis was finely tuned as a likeable light-hearted sidekick, despite his spirit being damned to hell. When it comes to the action, this is a very stylised production with a mix of cabaret and Tarantino about Faustus' adventures. His scholarly followers run around in bowler hats and the Seven Sins are introduced to him through a song and dance routine as though it's a night at the palladium. Their costumes, as with those of many other characters, are sinister, verging on the grotesque, befitting the world of magic, hell and purgatory. Lucifer - when she appears - is a real treat. A sassy blonde in a jumpsuit and heels, domineering Faustus into submission. Actress Eleanor Wyld plays the role devilishly good and you really wouldn't want to mess with her. What doesn't sit so well is the scene where Faustus calls for the beautiful Helen Of Troy to be conjured before him. The woman that sank a thousand ships is a mere child and their subsequent agitation together and dance of a kind are uncomfortable viewing and don't translate that well to the audience. Through 1 hour 45 minutes, with no interval, this is a fast-paced, reworking of Doctor Faustus with subtle humour injected into the storyline. Despite the gore seen through most of the play, the real horror of when Faustus' time is up isn't shown. Maybe Aberg thought it more chilling to leave the thought of being dragged to hell to the audience's own imaginings. What this production offers is a very fresh take on an age-old play with an eccentricity that Aberg is becoming known for. Continues until August 4, 2016.